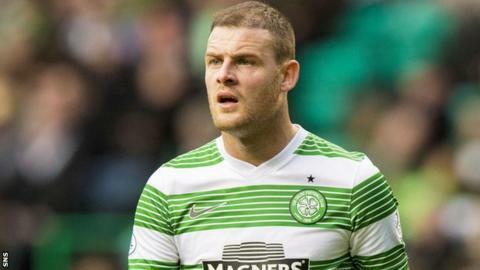 John Hughes has confirmed Inverness have enquired about taking Celtic striker Anthony Stokes on loan. Stokes has made just one league appearance for Celtic this season, and Hughes is keen to take the Republic of Ireland international to the Highlands. "We've made an enquiry but a number of teams have made an enquiry," Hughes said. "He has always scored goals for me so I know how to get the best out of him and control him." Stokes made his name during a loan spell at Falkirk under Hughes, when he hit 16 goals in 18 games, and then won his move to Celtic after hitting 24 goals when the pair were reunited at Hibernian. After enjoying success early in his Parkhead career, things have stalled for the striker this season under Ronny Deila. He was suspended by Celtic for two weeks after venting his frustration at being left out of the squad for a Premiership match against Inverness in December. Hughes, though, believes he is the man to bring the best out of the Irishman, and is excited at the prospect of partnering Stokes with another of Caley Thistle's loan strikers, Miles Storey. "I've known Stokesy since he was a young lad. I brought him from Arsenal up to Falkirk and he was a revelation. "There are slight comparisons with Miles and I'd get excited if we can partner these two up front. "I'm still friendly with Stokesy and I'm just hoping if Celtic decide to let him out on loan to a Scottish club, then hopefully he will come back and work with his old gaffer, because we have had a great rapport and a great relationship." Hughes also confirmed that Tobi Sho-Silva has returned to Charlton Athletic after being restricted to five substitute appearances during his loan spell with the club.